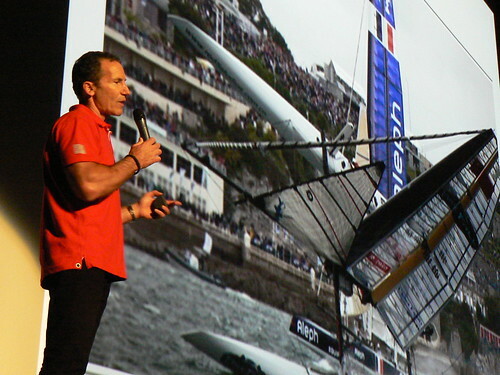 Artemis Racing CEO Paul Cayard talks to a sold-out crowd at the Alameda Theatre. Photo by Dave Bloch. What a week since last Thursday's column! Of course, it all started Thursday evening with the big Artemis Sailing community event at the historic Alameda Theatre. When our City of Alameda America's Cup Citizens Advisory Committee (of which I'm a member) dreamed of a community event when Artemis first arrived last year, we had no idea whether anyone would actually show up for such a thing. So having more than 700 tickets get snapped up (the theater told us they could have given out hundreds more) and seeing the theater - including the rarely-open balcony - almost completely full was pretty amazing. Committee member Deborah Wright pulled together a great team of organizers, volunteers, and supporting businesses that put this event together. Our MC for the evening was Kame Richards, a committee member and owner of Pineapple Sails here in Alameda. Kame introduced Mayor Marie Gilmore, Assemblyman Rob Bonta (who called the committee into existence two years ago when he was a councilman), Artemis CEO Paul Cayard and Artemis performance and design engineer Tom Schnackenberg. What really came out of the evening is hearing how much the Artemis team members, who come from around the world, really LIKE it here in Alameda. They spend enough time in San Francisco through the course of the year, and really enjoy coming back over to this small town on the sunny side of the Bay. Be sure to read Laura Casey's full report on the event, and watch Donna Eyestone's great video, right here at TheAlamedan.org! And view photos of the event at http://www.flickr.com/photos/44935689@N07/sets/72157632891333834. Also reported here in your online newspaper ... Alameda will be the home to the Luna Rossa Challenge team from Italy! There had been rumors that the staff of Alameda's Community Development Department had been negotiating with one of the teams, but the successful outcome became official with a press release this Monday morning. So, two out of three of the challenging teams are now based here! That means increased revenue for the city, and for the local businesses that provide not just maritime products and services, but all the other support services needed for the team members and their families. It also means that all those press releases, which go from the teams to new outlets around the world, carry the dateline “ALAMEDA, CA” on them. We’ve suddenly become quite a prominent place in the yacht racing world. Having two teams also adds to the conundrum that we've been facing up to now. With Artemis as our "home team," it was easy to know who to root for in the Vuitton Cup this summer (which determines the team that will challenge Oracle Racing in September). But now there may be some divided loyalties. Will it come down to which kind of meatballs you prefer, Swedish or Italian? If the last eight months of these Maritime Reports have raised your interest in sailing, and you've got kids or teens around, then don't miss the Junior Sailing Open House from1 p.m. to 4 p.m. this Sunday March 10 at Encinal Yacht Club! EYC's junior sailing program is renowned around the Bay and beyond. Stop by the club, take a tour, and even relax by the EYC's beautiful swimming pool. Sailboat rides, too! Encinal Yacht Club is located at 1251 Pacific Marina. For more information call 769-0221 or visit http://www.encinal.org.